This PMR study on the Tetrahydrofuran (THF) market offers an eight-year forecast for the global Tetrahydrofuran (THF) market between 2018 and 2026. The Tetrahydrofuran (THF) market study considers 2017 as the base year with market values estimated for 2018 and a forecast developed for the duration 2018 to 2026. The Compound Average Growth Rate (CAGR) for the Tetrahydrofuran (THF) market study has been represented from 2018 to 2026. This Tetrahydrofuran (THF) market study covers various perspectives of the market, including market dynamics, value chain and pricing analysis, competition analysis, regional and segmental growth comparison and macro-economic and industry growth analysis, along with segment-level projections in a comprehensive manner. As per the findings of the study and perspectives of industry participants, the global Tetrahydrofuran (THF) market is projected to grow at a CAGR of 7.8% between 2018 and 2026, in terms of value. The growing spandex industry and increasing demand for Tetrahydrofuran (THF) from solvent applications are some of the factors positively impacting the uptake of Tetrahydrofuran (THF) in the global market. The Persistence Market Research report on the Tetrahydrofuran (THF) market carefully analyses the market at a global and regional level through market segmentation on the basis of key parameters such as application and region. This Tetrahydrofuran (THF) market report is structured to facilitate the reader to develop a thorough understanding of the market. The report begins with market definitions, which are followed by market background, market dynamics and market analysis by key segments, regional analysis and competition landscape. Each section of the Tetrahydrofuran (THF) report covers a qualitative and quantitative assessment of the market on the basis of facts, historical developments and key opinions collected from industry participants through dedicated interviews and trends in the market. The Tetrahydrofuran (THF) market report begins with a market introduction, which defines the market taxonomy and product definitions with respect to the global Tetrahydrofuran (THF) market assessment. In the next section, the report describes the market development background, covering macro-economic factors and industry factors affecting the Tetrahydrofuran (THF) market for the base year considered for the study. The next section of the Tetrahydrofuran (THF) market report discusses market dynamics such as drivers (supply and demand side), restraints and trends impacting the market growth at a global level. This section also includes the impact assessment of market dynamics on the global Tetrahydrofuran (THF) market. Subsequent sections of the Tetrahydrofuran (THF) market report provide value (US$) and volume (New Sales in Kiloton) projections for the Tetrahydrofuran (THF) market on the basis of the aforementioned segments at a global level. The next section of the report presents a summarised view of the global Tetrahydrofuran (THF) market on the basis of six prominent regions considered in the study. All the above sections evaluate the present Tetrahydrofuran (THF) market scenario and growth prospects in the global market while the forecast presented in the sections assesses the market size in terms of volume and value. In addition, it is imperative to note that, in an ever-fluctuating global economy, we not only conduct forecasts in terms of CAGR, but also analyse the market on the basis of key parameters, such as Year-on-Year (Y-o-Y) growth, to understand the predictability of the Tetrahydrofuran (THF) market and identify the right opportunities available. 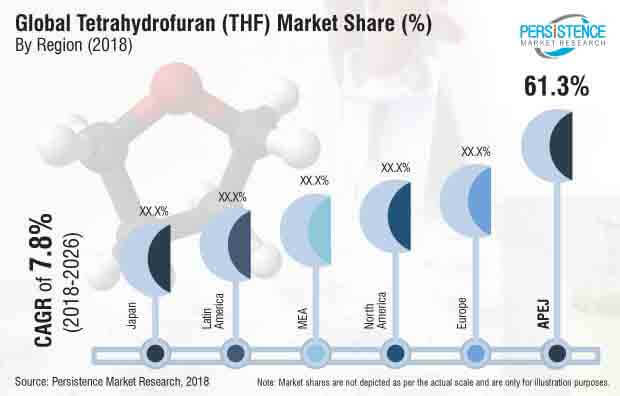 Another key feature of this Tetrahydrofuran (THF) report is the analysis of all key segments in the Tetrahydrofuran (THF) market, sub-segments and the regional adoption and revenue forecast in terms of absolute dollar opportunity. This is traditionally overlooked while forecasting the market; however, the absolute dollar opportunity is critical in assessing the level of opportunity that a provider can look to achieve as well as to identify potential resources from a sales and delivery perspective. In order to understand the key market segments in terms of growth across concerned regions, Persistence Market Research has developed an attractiveness index, which will help providers identify real market opportunities. In the final section of the Tetrahydrofuran (THF) market report, a competitive landscape of the Tetrahydrofuran (THF) market has been included to provide report audiences with a dashboard view, categorised on the basis of providers present in the value chain, their presence in Tetrahydrofuran (THF) market and key differentiating factors and strategies. The primary category of providers covered in the report includes Tetrahydrofuran (THF) manufacturers. This section in the market report is primarily designed to provide clients with an objective and detailed comparative assessment of the key providers specific to a market segment in the value chain of the Tetrahydrofuran (THF) market. Examples of some of the key competitors covered in this report include Dairen Chemical Corporation, Nan Ya Plastics, BASF, Ashland, INVISTA and SIPCHEM. Tetrahydrofuran (THF) is a chemical compound having molecular formula C4H8O. It is majorly derived from 1, 4-Butanediol. It is majorly used as a precursor of polymer and as a solvent for Grignard reaction. Tetrahydrofuran (THF) is gaining importance because of increasing demand for PTMEG production. Improving economies of emerging countries are also pushing the global market of Tetrahydrofuran (THF). There are several processes used for the manufacturing of Tetrahydrofuran (THF). Tetrahydrofuran (THF) can be manufactured using furfural through the corbonylation and hydrogenation process. Tetrahydrofuran (THF) can also be manufactured from maleic anhydride through catalytic hydrogenation. However, the most widely accepted process of Tetrahydrofuran (THF) manufacturing is through 1, 4-butanediol dehydration and cyclization. Other methods of Tetrahydrofuran (THF) manufacturing include the dichloro-butane method and butadiene oxidation method. Tetrahydrofuran (THF) is used in a wide range of applications. Major applications of Tetrahydrofuran (THF) include pharmaceutical, solvent and PTMEG. Tetrahydrofuran (THF) is used as a solvent in the production and processing of various polymers and adhesives. It (THF) finds its largest use in the manufacturing of PTMEG and polytetrahydrofuran. THF is polymerized to form PTMEG which is used as a raw material for various fibers (Spandex) within the textile industry. Spandex is used in various textile apparels for improving the properties of textiles. The PVC production industry is responsible for a major share of THF demand. Within the pharmaceutical industry, Tetrahydrofuran (THF) is primarily used as a reaction medium in processes, such as Grignard syntheses or reduction of lithium aluminium hydride. It is also used as an extractor for various drugs. Large-scale production of API drugs is responsible for a major share of THF demand in India. The global Tetrahydrofuran (THF) market is estimated to be valued at US$ 1.5 Bn by 2018 end and is expected to reach US$ 2.8 Bn by the end of 2026 while expanding at a CAGR of 7.8% over the forecast period. The global Tetrahydrofuran (THF) market is projected to represent incremental opportunity of over US$ 1264.3 Mn between 2018 and 2026. Tetrahydrofuran (THF) is generally used as an intermediate raw material or as a solvent in applications, such as PTMEG, PVC, pharmaceuticals, magnetic tapes, adhesives, paints and coatings, amongst others. Thus, the PTMEG industry is expected to hold a leading share in terms of demand for Tetrahydrofuran (THF) during the forecast period. As per the PMR analysis, increasing demand for manmade fibers is pushing the demand for spandex within the textile industry. PTMEG is used for the production of spandex. Increasing demand for special purpose textiles from all over the world is expected to drive the demand for Tetrahydrofuran (THF) during the forecast period. China and India hold dominant shares in the textile industry globally and thus, rapid growth of Asian markets is bolstering the Tetrahydrofuran (THF) market in the region. Growing demand for Tetrahydrofuran (THF) from PVC and other solvent applications is also pushing the demand for (THF) in the Asia Pacific region. That apart, Tetrahydrofuran (THF) is favored for Grignard reactions in the pharmaceutical industry, which is pushing its use in this industry. The Global Tetrahydrofuran (THF) market is segmented by region into North America, Europe, APEJ, Latin America, MEA, and Japan. PMR analysis shows that the Tetrahydrofuran (THF) market in Asia Pacific Excluding Japan (APEJ) holds the largest share in the global market due to the presence of large textile, polymer and pharmaceutical and chemical industries in the region. China accounted for the largest market, not only in APEJ, but also in the world. PMR analysis also shows that the Tetrahydrofuran (THF) market might suffer due to oversupply. This can be attributed to the low prices of Tetrahydrofuran (THF) in the APEJ market. Large capacity addition has been done in the past years by various players, which has led to an oversupply situation in the market. However, growing demand from the PTMEG application is expected to balance the situation over the forecast period. The global Tetrahydrofuran (THF) market is highly consolidated with the presence of few large manufacturers. Some of the important global players operating in th market are Dairen Chemical Corporation (DCC), BASF SE, Mitsubishi Chemical Holdings Corporation, Sipchem, and others. Dairen Chemical Corporation accounted for the leading share in the global Tetrahydrofuran (THF) market and was followed by BASF SE and other players. Large capacities of production and comparatively low demand is the reason for the low operating rates in the Tetrahydrofuran manufacturing plants. That apart, advancements in technologies and new product developments by various players are also expected to change the market scenario during the forecast period. The supply and demand of Tetrahydrofuran (THF) in different regions is dependent on the macro-economic factors affecting the Tetrahydrofuran (THF) market. Moreover, the demand shift from matured markets to high growth market can be attributed to increasing demand from emerging economies. The market his witnessed large capacity additions in the past few years. Large players in the market are increasing market share by plant expansion and new product developments. Expansion strategy has accounted for more of the total developments in the market in the last 8 years. Tetrahydrofuran (THF) manufacturers are also trying to penetrate the market through joint ventures and partnerships. BASF opened its first catalyst manufacturing facility in Asia. The facility will be based in China and will cater to the growing demand for catalysts from the Asian region. These catalysts are used for the manufacturing of various chemicals, including butanediol. Butanediol is used for tetrahydrofuran (THF) manufacturing. Growing spandex demand from the Asia Pacific is expected to drive the demand for the Tetrahydrofuran (THF) during the forecast period. New Developments, such as bio-based Tetrahydrofuran (THF), have been observed in the market. BASF launched its bio-based PolyTetrahydrofuran product, in 2015, in the market. Such developments are expected to push the sustainable demand for Tetrahydrofuran (THF) during the forecast period. Some of the players reported in this study on the global Tetrahydrofuran (THF) market include Dairen Chemical Corporation, Nan Ya Plastics, BASF, Ashland, INVISTA, Lyondellbasell and SIPCHEM.